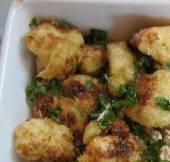 This is a simple, tasty recipe for a side serving of cauliflower. 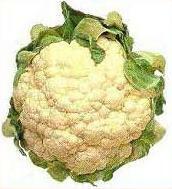 Greeks will always have vegetables to accompany their meals, and cauliflower is a popular vegetable. 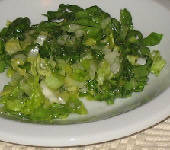 The olive oil and lemon juice salad dressing adds flavour to the vegetable. If you like, you can add some herbs such as dill, parsley or oregano to the salad dressing. Cut off the hard stalk and outer leaves. Cook until just tender by any method – boiling, steaming or pressure cooker. When cooked, cut into large portions and place on serving plate. Whisk about 3 tablespoons oil to 1 1/2 tablespoons lemon juice together in a cup until it becomes opaque. Add extra quantities if needed. Pour dressing over cauliflower and season with salt and pepper to taste.